A construction worker takes on the speaker of the House—and sparks fly. 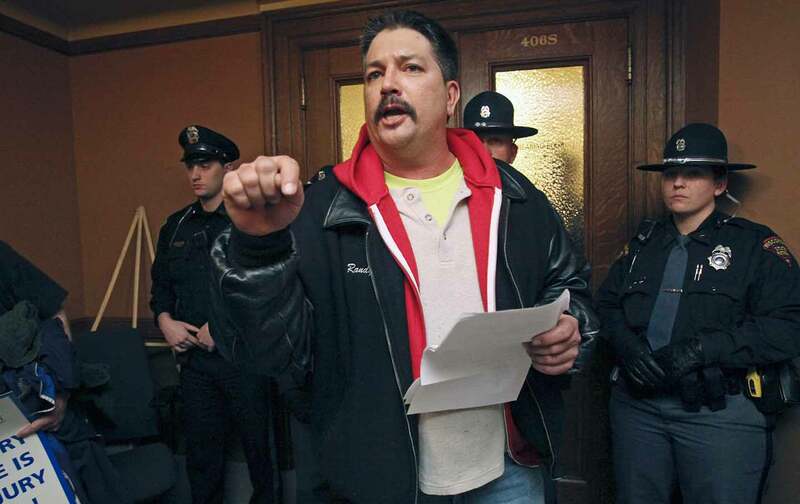 Randy Bryce thinks Paul Ryan is vulnerable to a challenge that offers voters a genuine, working-class alternative to the gold-plated speaker of the House. The union ironworker, who is challenging the most powerful Republican in Congress, is onto something. He recognizes that Ryan, a political careerist who had spent the better part of three decades as a Republican aide and congressman, represents southeastern Wisconsin’s first congressional district in name only. The speaker of the House is still officially identified as Paul Ryan, R-Janesville. But everyone who is paying attention knows that the congressman serves as Paul Ryan, R–Wall Street. Bryce has never run for Congress before. He is one of several Democrats who are either running, or looking to run, against an incumbent who will be lugging Donald Trump’s political baggage in 2018. But the veteran union activist has gained lots of attention, and substantial support, since the launch of a strikingly well-framed challenge to Ryan that goes to the heart of the speaker’s vulnerabilities. That’s a working-class-versus-ruling-class argument that we need to hear a lot more of in American politics. And it is strengthened by Bryce’s determination to call out Ryan and other Republicans for serving Wall Street rather than Main Street—not just on the vital issue of health-care reform but on every issue. Again and again, when it has come time to choose, Ryan has picked the side of the big banks and the investment houses, the insurance industry and the health-care profiteers that fund his campaigns over the best interests of a region that has been battered by Ryan’s policies. As Wall Street’s man on Capitol Hill, Ryan has steadily stacked the deck against Wisconsin workers, farmers, and small-business owners. In 2008, he rounded up Republican votes for the Wall Street bailout, which responsible conservatives recognized as crony capitalism at its worst. Ryan begged Republicans to back the bailout, warning that the United States might be “standing at the edge of this abyss” if Congress did not immediately steer tax dollars to the bankers who were crashing the economy. The Wisconsin Republican has over the years appeared at Tea Party rallies and attempted to position himself as a champion of the movement’s opposition to DC deal-making. But when Congress gets to work on the big issues, Ryan backs the bailouts and policy shifts that steer tax dollars to big banks and the speculators. He also backs the trade deals that Wall Street wants but that have been devastating for Janesville. The speaker’s hometown of Janesville has historically been a major manufacturing center. Now it has fallen on hard times. Like so many manufacturing communities in the Great Lakes region, it has been rocked by the outsourcing of US jobs. That’s not Ryan’s concern, however. Since his election to the House in 1998, Ryan has voted for free-trade pacts—including the extension of most-favored-nation trading status to China—that have been absolutely devastating to Janesville and other communities in his southeastern Wisconsin district. In 2008—during the presidency of George W. Bush—General Motors announced that the sprawling plant that had been Janesville’s top employer for nine decades was closing. Thousands of jobs were lost. Unemployment soared. It has edged down since, but a lot of working families in Janesville and surrounding Rock County are still struggling. How did Ryan respond to Janesville’s hard times? First he proposed schemes to shred the social safety net by gambling Social Security funds in the stock market and by undermining Medicare and Medicaid. Now, he proposes to undermine health-care protections for millions of Americans in order to fund tax cuts for the rich. As Janesville and other communities that needed a congressman have taken hits, Ryan has risen in stature. He has run for vice president and now, as House speaker, he is second in the line of succession for the presidency. Ryan is a very powerful man. Yet he isn’t using that power to represent Janesville or Racine or Kenosha or the other communities of southeastern Wisconsin. What connects the bailouts and the sellouts to trade with Ryan’s current attempt to leave 23 million more Americans without health care in order to fund a tax cut for the very rich is this speaker’s choice to serve the royals, the robber barons, the money changers of our time. Paul Ryan has made a choice that reveals his values, which were forged in elite restaurants of Washington and Wall Street, where campaign donations are discussed and delivered with $350 bottles of wine. Randy Bryce has a different set of values, forged on the work sites of Wisconsin. “My values are my neighbors’ values, and we know that Washington has gotten way off track,” says the challenger. If Bryce keeps emphasizing how and why Paul Ryan steered things off track, he has a chance to change the political debate—and the values debate that must underpin it if anything is ever going to change—in Wisconsin and America.